Dongbei University of Finance and Economics, Dalian, China. Received August 11th, 2010; revised October 6th, 2010; accepted November 19th, 2010.
growth. 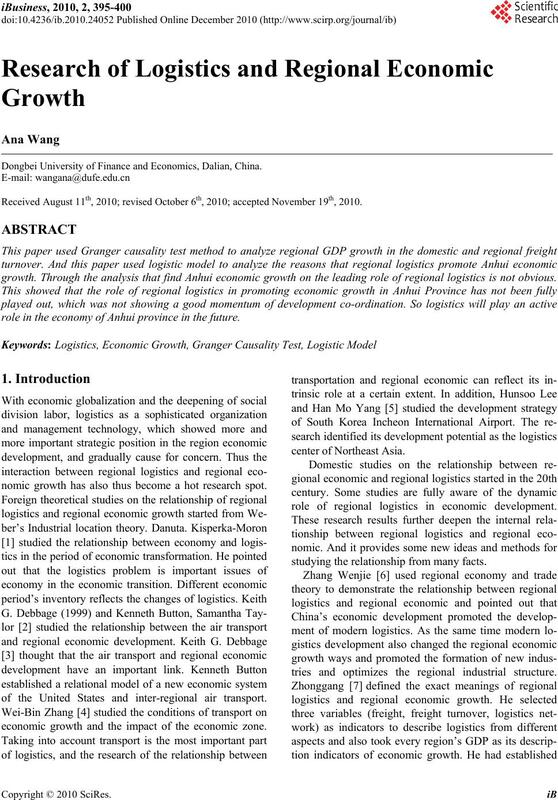 Through the analysis that find Anhui economic growth on the leading role of regional logistics is not obvious. role in the economy of Anhui province in the future. nomic growth has also thus become a hot research spot. of the United States and inter-regional air transport. 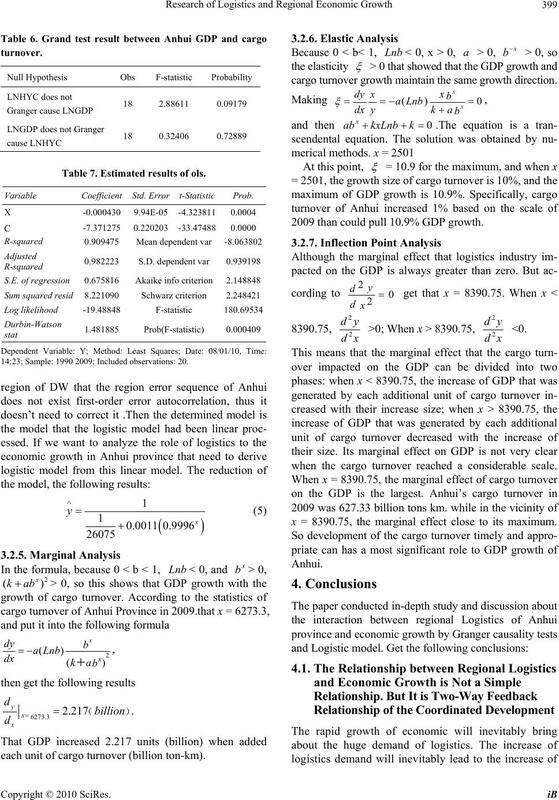 economic growth and the impact of the economic zone. role of regional logistics in economic development. studying the relationship from many facts. tries and optimizes the regional industrial structure. 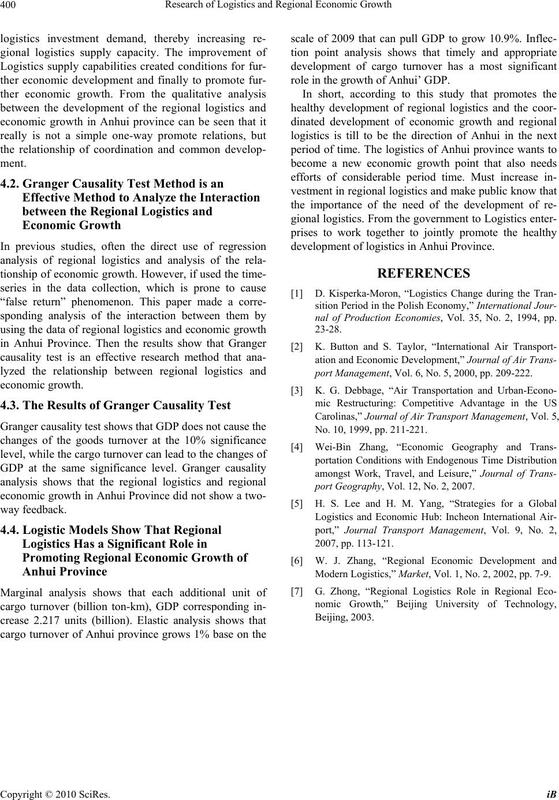 Anhui regional logistics is more appropriate (Table 1). 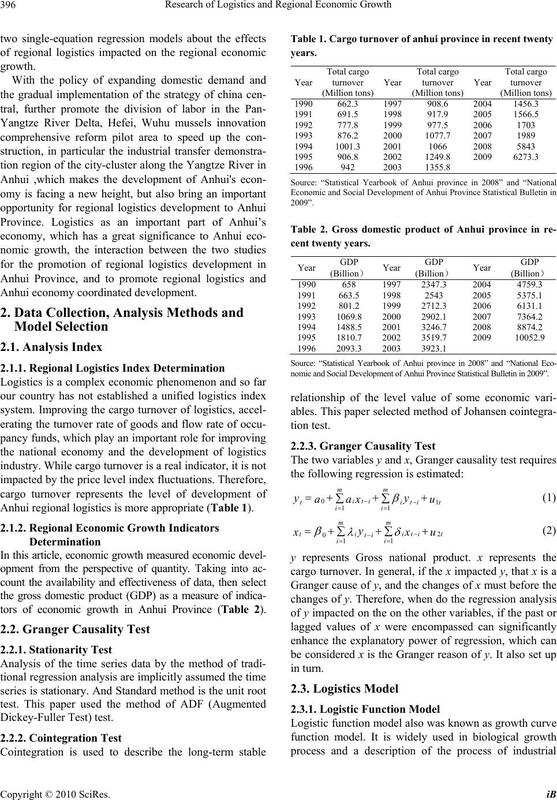 tors of economic growth in Anhui Province (Table 2). nomic and Social Development of Anhui Province Statistical Bulletin in 2009”. gradually converge to zero, close to a horizontal line. nomic growth also has a maximum, and then stabilized. ket of Anhui province continuously improve. opment of regional logistics objectively. moted the rise and development of regional logistics. promote the rapid economic growth in Anhui Province. indicators are as Table 3 shows. th indicators (GDP) and the stationarity of time series. paper chooses the method of Johansen cointegration test. 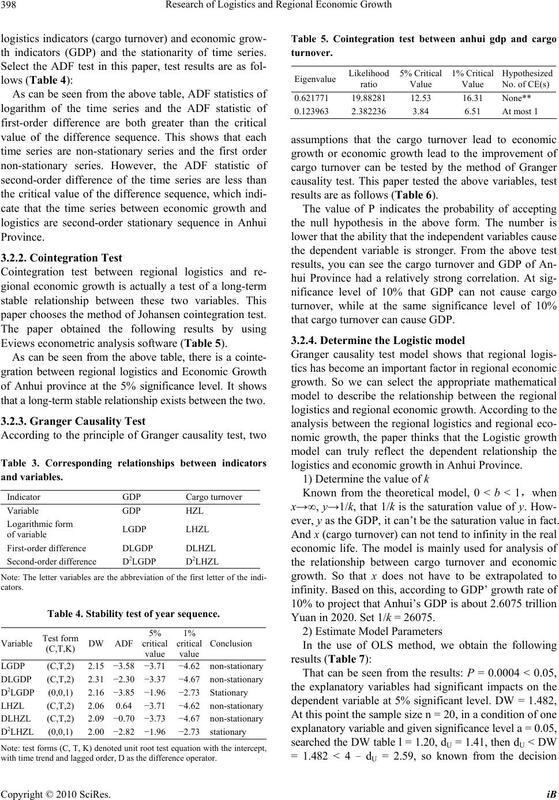 Eviews econometric analysis software (Table 5). that a long-term stable relationship exists between the two. Table 4. Stability test of year sequence. with time trend and lagged order, D as the difference operator. results are as follows (Table 6). that cargo turnover can cause GDP. logistics and economic growth in Anhui Province. ever, y as the GDP, it can’t be the saturation value in fact. Yuan in 2020. Set 1/k = 26075. Table 7. Estimated results of ols. 14:23; Sample: 1990 2009; Included observations: 20.
each unit of cargo turnover (billion ton-km). cargo turnover growth maintain the same growth direction. 2009 than could pull 10.9% GDP growth. when the cargo turnover reached a considerable scale. x = 8390.75, the marginal effect close to its maximum. role in the growth of Anhui’ GDP. development of logistics in Anhui Province. nal of Production Economies, Vol. 35, No. 2, 1994, pp. port Management, Vol. 6, No. 5, 2000, pp. 209-222. No. 10, 1999, pp. 211-221.
port Geography, Vol. 12, No. 2, 2007. 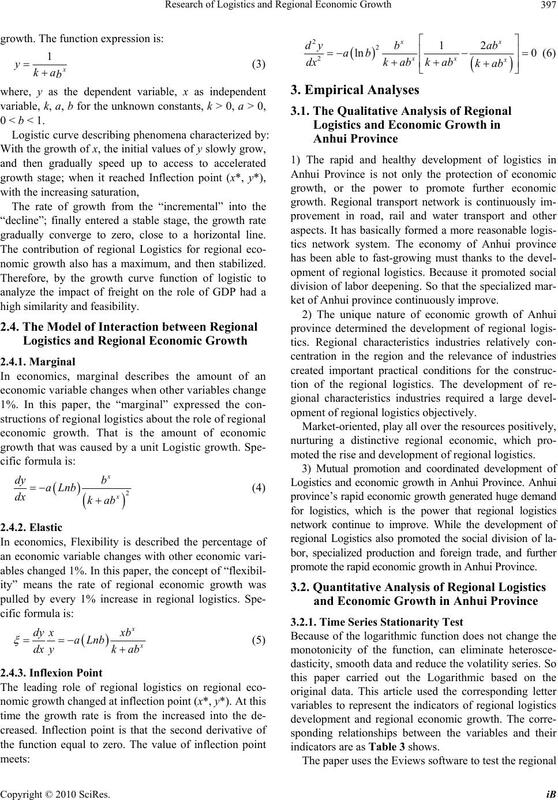 Modern Logistics,” Market, Vol. 1, No. 2, 2002, pp. 7-9.